We're not preparing to fight the aliens. This isn't a scene from Independence Day 2. 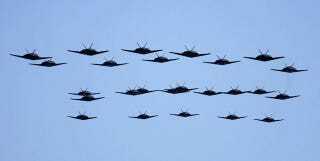 It's just a throwback photo of 25—yes, twenty five—Lockheed F-117A Nighthawk black stealth fighter jets celebrating its 25th anniversary back in 2006. What a beautifully intimidating celebration of power it was. According to The Aviationist, the jets flew over Heritage Park at Holloman Air Force Base. Code One Magazine recently put up the photo taken by Denny Lombard for Lockheed Martin on its Facebook page.